Hyundai recently introduced an automatic transmission option for the Elite i20 facelift. Even though the Elite i20 facelift was launched at the 2018 Auto Expo, it was only available with a manual transmission until recently, with both petrol and diesel engines. The Elite i20’s rival in the premium hatchback space, the Maruti Baleno, also comes with the option of a CVT with the 1.2-litre petrol engine. Let’s see how these cars, in their CVT avatar, fare against each other on paper. The Maruti Baleno is marginally longer, wider and taller than the 2018 Hyundai Elite i20. 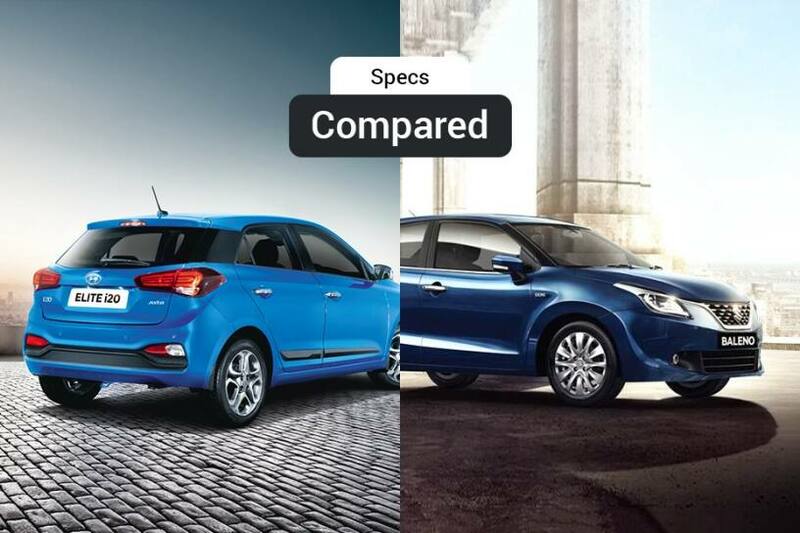 And despite having a longer wheelbase (50mm longer), the Elite i20 doesn’t top the Baleno on front or rear knee-room, as per our measurements. The Baleno also has a bigger boot compared to the Elite i20, while ground clearance of both the cars is identical. The CVT, on both the cars, can be had with petrol engines only. Here’s how the engines fare on paper. Verdict: Since both, the Elite i20 Magna Executive and the Baleno Delta are positioned above the entry-level variants, they get almost all the basic equipment. But the Baleno Delta gets an array of comfort and convenience features such as auto AC, 60:40 split rear seats, remote keyless entry and steering mounted audio controls that the Elite i20 Magna Executive doesn’t. And since it’s only Rs 5,000 more expensive, the Baleno Delta CVT is the car to go for at this price point. The Asta variant of the Elite i20 gets reverse parking sensors, rear view camera with display on AVN, tilt and telescopic steering, rear defogger, 15-inch alloys, height adjustable driver seat, auto AC, rear wiper and washer and electrically adjustable/foldable side mirrors. It also gets a 7-inch touchscreen infotainment display with Apple CarPlay and Android Auto along with steering-mounted audio and Bluetooth controls, and voice commands. The Baleno Alpha gets daytime running lamps with LED projector headlamps, 7-inch infotainment system with Apple CarPlay, reverse parking camera, 16-inch alloy wheels, auto AC, navigation system, voice command, tilt and telescopic steering, height adjustable driver seat and push-button start/stop. The prices of the Elite i20 Asta CVT and the Baleno Alpha CVT are Rs 8.16 lakh and Rs 8.40 lakh (ex-showroom Delhi), respectively. The i20 gets Android Auto, which the Baleno doesn’t while the the Baleno gets LED projector headlamps and push-button start/stop that the Elite i20 doesn’t. It would have been great had Hyundai provided the CVT option in its top-spec Asta (O) as it comes with enhanced safety courtesy side & curtain airbags, auto headlamps, projector headlamps with LED DRL, 16-inch alloys and push-button start/stop. But then, it would have shot the asking price to around Rs 8.90 lakh. Verdict: The price difference between the Baleno Alpha and the Elite i20 Asta CVT is Rs 24,000 with the former being the costlier car here. Even though the top-end Baleno does get some additional features over the Elite i20, you wouldn’t miss them badly on the Hyundai. It doesn’t happen too often but in this case, it boils down to your choice since both of these are very closely matched, at least on paper.